The Chicken Littles in Ethiopia are out to paint a picture of strife, conflict and war on the first anniversary of PM Abiy’s administration. But he does not mind all the Chicken Littles clucking to rain on his parade. He knows he is lionized by millions and demonized by few. Happy Anniversary. It is a psychological war aimed at manipulating minds, crushing hearts, fraying nerves and breaking down the spirit of the people. It is a psychological war designed to create uncertainty in the outcome of our peaceful revolution. Now, the Chicken Littles think they can rain on PM Abiy parade on April 2. But the facts speak for themselves. The Chicken Littles think they can cluck rain on PM Abiy’s magnificent 1-year parade. They think they can blacken his stellar achievements by clucking doom and gloom. 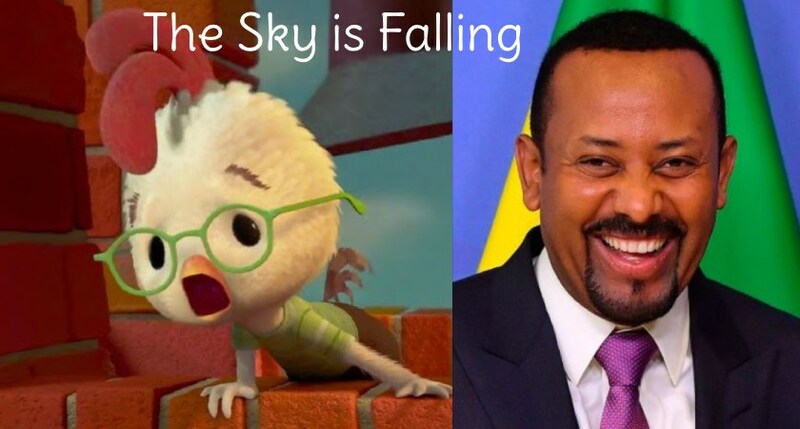 PM Abiy does not mind all the Chicken Littles clucking to rain on his parade. He knows there is no rainbow without rain. He knows at the end of the rainbow there will always be, until the end of time, green, yellow and red. PM Abiy will never let the sun set on the green, yellow and red of the rainbow nation of Ethiopia! But I forgot to tell him that Ethiopia does not have heroes because she has too many Chicken Littles who run around clucking and spreading fake news, disinformation, white lies and tall tales. These are the same Chicken Littles who are all gung-ho to rain on his first anniversary. But the story of Ethiopia’s Chicken Littles is nothing new. These Chicken Littles don’t bother to gather evidence, assess its relevance, critically evaluate it and come to logical conclusions. They are driven by and are at the mercy of their raw emotion. They substitute anger, alarm, frustration, grief, fear and anxiety for hard facts. Facebook, YouTube and other online media have become virtual henhouses for many of Ethiopia’s Chicken Littles. Facebook has become the command center for the faceless infowarrior Chicken Littles who spread fake news and disinformation and mindlessly preach their gospel of hate. Over the past year, the TPLF Chicken Littles have done everything they can to bring about instability and strife in Ethiopia. They have fomented ethnic conflicts throughout the country. They have been crying wolf about an imaginary genocide that is going to be committed on them to fire up their base and solidify support. They bellyache about being singled out for ethnic persecution and what have you. These are the Chicken Littles whose time is long past and should remain in pasture. But they want to remain relevant so they use intrigue and deception to capture the spotlight. The talking head Chicken Littles like to play pundit. They are always talking about the negative and how they have predicted bad things would happen. They make mountains out of molehills. Why are the Chicken Littles able to cause so much alarm and anxiety among the population? It is because herd mentality and groupthink are a common phenomenon among many Ethiopians. Group think is the flip side of the herd mentality problem. Many Ethiopians hold an opinion in a group believing the group is right. They agree on an opinion without much questioning, critical reasoning or scrutiny of the evidence. There is a sure surefire way of fighting and winning the inforwars against the Chicken Littles of Ethiopia. There is one and only one weapon the Chicken Littles fear the most: TRUTH. The only way to fight the Infowars of fake news, disinformation and conspiracy theories is by simply exposing lies of the Chicken Littles and telling the truth. Let’s cut off at the Facebook and social media passes. Let’s educate our people of good will and good faith. The Chicken Littles feed on our anger, sorrow, fear and anxiety. Let’s fight them by developing emotional intelligence, that is the ability to identify and manage our own emotions and the emotions of those around us. I have been blessed to spend the last 13 years of my life fighting for human rights in Ethiopia. It’s is true I did not fight with the weapons of war. For 13 years, I was in the trenches day and night fighting with my pen and keyboard the Prince of Darkness himself and his Army of Darkness. Truth be told, I am the only Ethiopian whose Ethiopian identity the TPLF has ever challenged in public. For the TPLF, there is no such person as an Ethiopian. There is an Oromo, Amhara, Tigray, Gurage… living in Ethiopia, but never an Ethiopian without an ethnic tag attached to his/her name. But I taught the TPLF a lesson they will never forget, EVER! I am PROUD ETHIOPIAN. In that letter, I expressed my full confidence in his goodwill and promises to do good by all Ethiopians. I assured him that if he keeps his side of the bargain I will always be in his corner and have his back. In less than a year, PM Abiy exceeded my wildest expectations by leaps and bounds. Why the hell should I not give PM Abiy my full and unqualified support!? If he can deliver on every one of his numerous promises, I sure as hell can deliver on single one of mine. Yes, I back Abiy Ahmed one thousand percent! I support him not because he is a the perfect leader. But he has done so many things no Ethiopian leader has ever done. But PM Abiy has yet to prove that he can walk on water! I vigorously defended Meles Zenawi’s right to speak at Columbia University in 2010 and became a target of Diaspora vilification. It did not matter to me what the critics had to say. As a matter of principle, Meles had the right to speak in America, even if he had muzzled 100 million people at home. I have spent the last 13 years of my life speaking my truth to power, to the powerless, the power hungry and power thirsty. I seek nothing and will accept nothing for the work I do or have done for my motherland. It is a blessing and a special honor for me. My adaptation of that old saying is, “The Chicken Littles will cluck, but the rooster will keep on ruling the roost.” After all, it is only natural that the little chickens cluck and the gracious rooster crows. On a personal note, I consider all of the clucking of the Chicken Littles in Ethiopia nothing more than chicken bowel movement. For Abiy Ahmed, the sky is not falling because for him the sky is not the limit.